This Friday, June 20, would have been the 80th birthday of Yuri Vizbor (1934-1984), singer-songwriter, actor, teacher, journalist, mountain climber, and radio operator, among others. 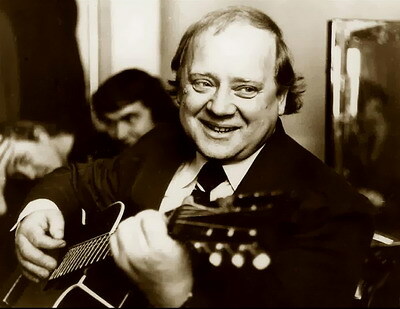 These days, some 30 years after his death, Russians remember Yuri Vizbor primarily as a songwriter – someone who wrote “bard” songs or “author” songs, on par with Bulat Okudzhava, Aleksandr Galich, Vladimir Vysotsky, and other great poets of his generation. Some will remember that he was also an actor, albeit not a professional one. Some may deduce from his songs that he was an avid mountain climber. But he was much, much more. Some of the most important events in Vizbor’s life – in his own telling – happened by accident. He claims he was born “due to negligence,” to a young Ukrainian woman and a passionate Lithuanian officer, Yusef Vizboras (the distinctively Lithuanian suffix –as was later lost in translation). The university he attended was similarly accidental: a classmate and friend of his convinced him to go look at the main building of the Moscow State Pedagogical Institute, and, impressed by the architecture, he agreed to join his friend and apply together. Little did he know, the place was teeming with “bards,” including Yuliy Kim and Ada Yakusheva (spoiler alert: Vizbor later married her). Vizbor quickly made a name for himself in these circles – plus, one of his songs is now the Institute’s (now University’s) official anthem. But, you might say, what was a songwriter doing at a Pedagogical Institute? As was true for many other bards, Vizbor’s most lasting legacy was a side project to a completely unrelated career. Upon graduation he was certified as a “Russian and literature” teacher, and was sent to Arkhangelsk to teach, but was almost immediately drafted into the army and stationed in Karelia (Kandalashka), where he was trained as a radio operator. Songwriter, teacher, radio operator… Vizbor just kept adding job titles. Next he went into journalism, at times filing reports in song. He also participated in various extreme sports, going on mountain climbing trips all over the Soviet Union and even becoming a ski instructor. (When did he have time for all this?) Naturally, many of his most famous songs concern hiking through the woods, climbing his favorite mountains, and long road trips. To round out his already well-rounded life, Vizbor was also an occasional actor. When a director called him out of the blue to cast him in an upcoming movie, he thought it was a prank – his diploma said “teacher,” not “actor”! But for an amateur actor he didn’t do too shabbily, appearing in over a dozen films and voicing several more. Ironically, in his most famous movie appearance – as Martin Bormann in Seventeen Moments of Spring – his distinctive, slightly out-of-tune voice was replaced with another actor’s. Did Vizbor know he was going to end up with so many careers? Well, no. “For myself,” he writes in his autobiography, “I thought I was going to become either a soccer player, or a pilot.” Good guess, young Yuri, but life had a lot more in store for you!